When I make chicken cutlets in my house I could never make enough. Kept wrapped in the refrigerator, they are great for sandwiches and just plain snacking. My son Joseph eats them like chicken fingers. He would never refuse a meal of chicken cutlets. They are one of his all time, any time, favorite comfort foods. When my mother or grandmother made them they always served the cutlets with a salad and loaf of crisp Italian bread. 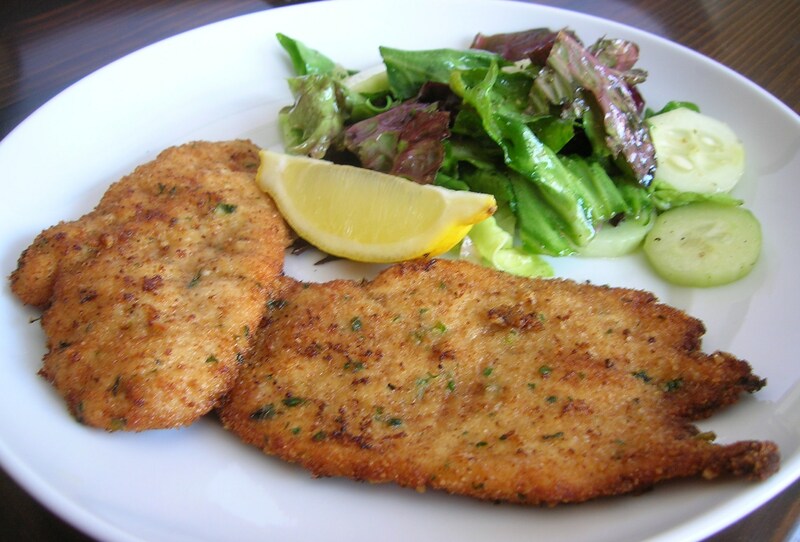 When you eat these cutlets together with the salad they make a great flavor combination in your mouth. 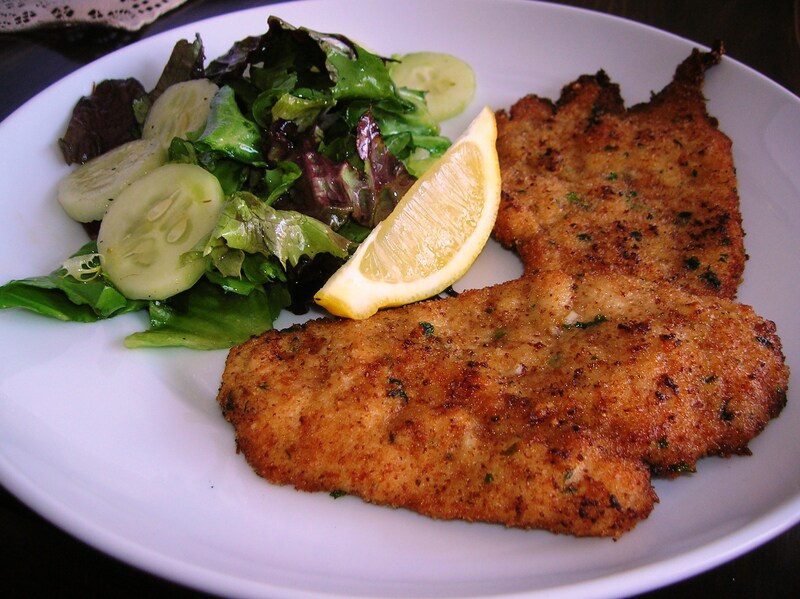 With just a wedge of lemon to squeeze over the cutlets, you have the making of a wonderful meal. As a leftover, these cutlets make great sandwiches. My all time favorite is to take a loaf of Italian bread and toast it. I then rub a clove of garlic over the toasted inside of the bread and butter it. On top of that I put the chicken cutlets, roasted red peppers and slices of sharp provolone cheese. I then place the open face sandwich in the oven to melt the cheese. Add some arugula on top of that with a sprinkle of balsamic vinegar. Man…that’s a good sandwich! 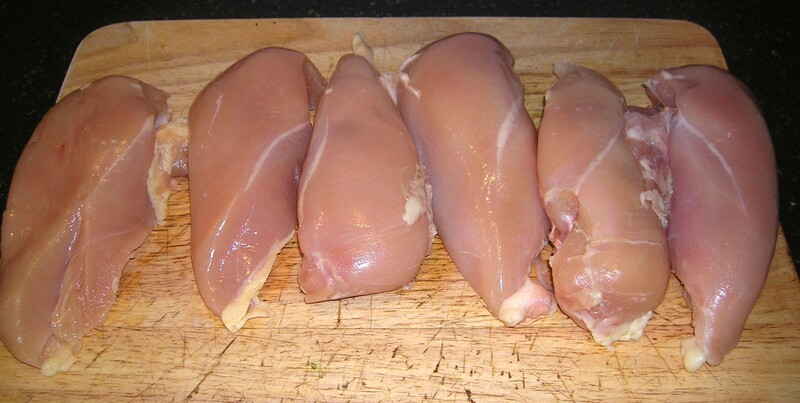 To prepare the chicken, lay the breast on your cutting board and slice width wise against the grain. 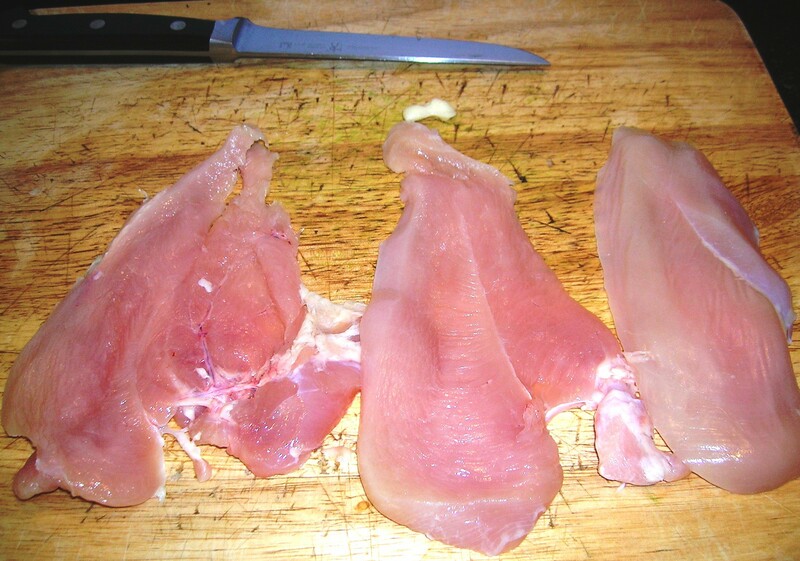 You should get three slices of cutlet for each breast. 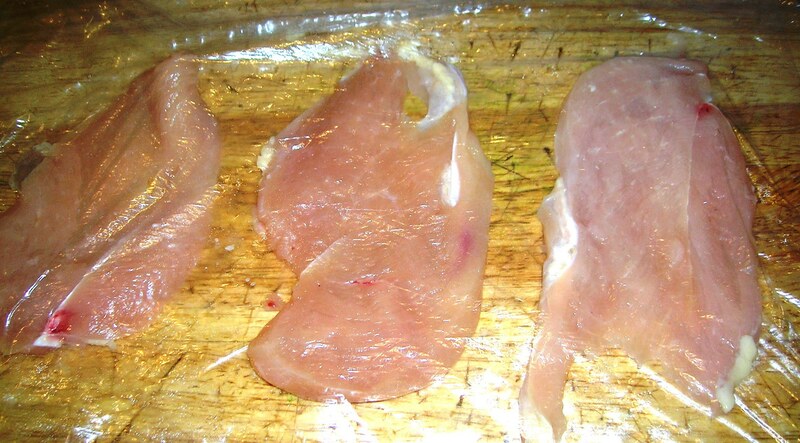 Between two layers of plastic wrap, pound each cutlet till they are flattened 1/4 inch thick. Lay the prepared cutlets on a plate. Mix the plain bread crumbs in a medium bowl with the cheese, garlic, parsley, basil, oregano, salt and pepper. Place the prepared crumbs on a flat plate. Beat the two large eggs in a medium bowl with a pinch of salt and pepper. Dip each cutlet in the beaten eggs to cover both sides. I like to put all the cutlets at once in the egg mixture and mix them around. Lift the cutlet out of the egg and hold up to let the excess egg drip off. Place the cutlet in the bread crumbs and press down to coat. Turn the cutlet and coat the other side, pressing down to make sure the breading sticks. Shake off any excess breading and place the cutlet in a clean plate. Finish off the rest of the chicken in the same way. Heat a large frying pan with enough oil to cover the pan and come up the sides about a half an inch. I like to use a combination of peanut oil and regular olive oil for added flavor. You can also use canola oil and olive oil. Use 3/4 vegetable oil to 1/4 olive oil. 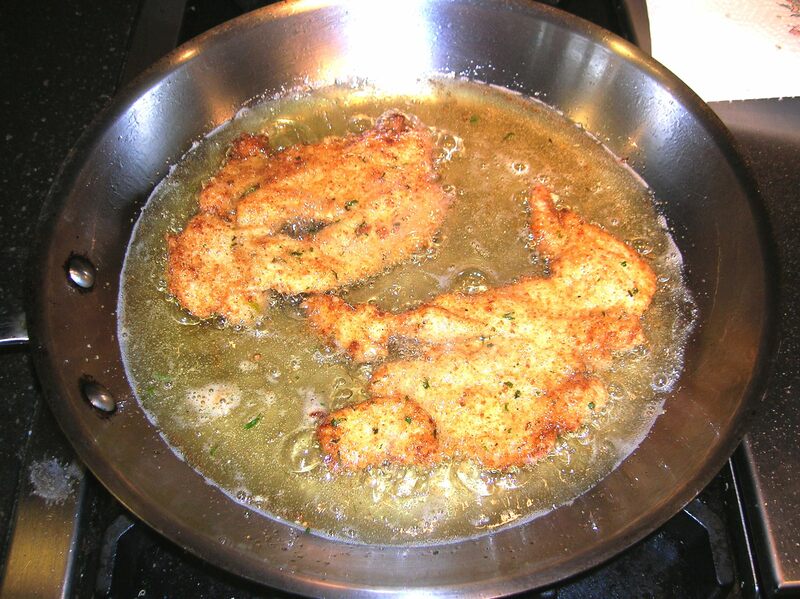 When the oil is hot fry the cutlets on medium heat about 2 minutes each side or until golden brown. 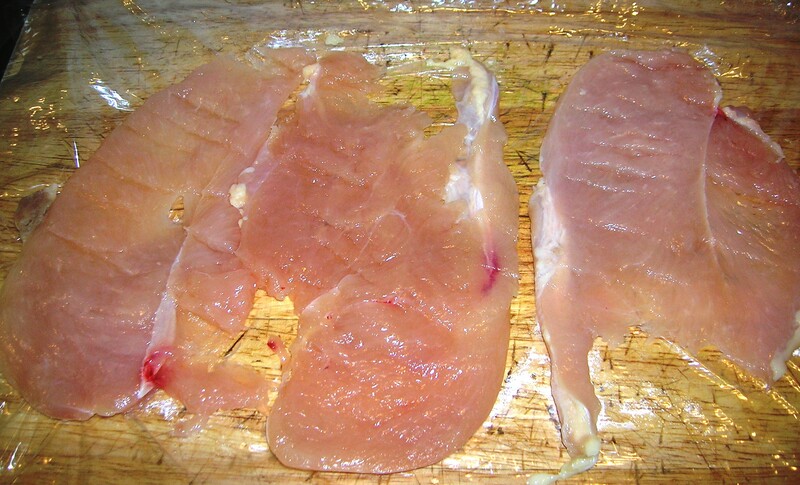 Place the cooked cutlets on a clean plate lined with a couple of sheets of paper towel. As you fry the cutlets in batches you can keep the cooked ones in a 200 degree oven to keep warm, covered in foil. I enjoy these chicken cutlets just the way they are with a wedge of lemon to squeeze over the top. That’s a true chicken cutlet Milanese. Add a side salad and you have a meal. You are also halfway there in preparing Chicken Cutlet Parmigiana. Just place the cooked cutlets in a baking pan, cover with marinara sauce, sprinkle some Parmesan cheese over the top and finish with a good helping of mozzarella. Bake uncovered for about 15-20 minutes in a 375 degree oven or until the cheese is melted and bubbling. My son Michael enjoys these cutlets with a side of mayonaise to dip in. “Americana”! The left overs are always enjoyed and eaten as snacks or for sandwiches. Ok, I have to admit, I love a chicken cutlet sandwich on a crisp Italian roll with lettuce, tomatoe and mayo. This entry was posted in Chicken and tagged chicken cutlet, chicken cutlet Milanese, Italian chicken cutlet. Bookmark the permalink.